The San Antonio Handweavers Guild marks its 80th anniversary in 2018. Members' exhibit features a collection of handwoven and handcrafted items designed to honor our city during the Tricentennial celebration. Want to save a tree while still being able to keep track of your receipts? Easy! We can now email or text your receipts! (and we're very glad of it, because our receipt printer is currently on the fritz - we can still print one for you, but it'll be on 8x11 paper with the regular printer. Catalina by Tahki is deceptively complex – while it appears to be one thickness on the ball, it creates thick-and-thin textural striping when knit. Details: 100% Mercerized Cotton, 131 yds, handwash, lay flat to dry. Gauge: 16 sts and 23 rows = 4” (10cm) on #6 (4mm) needles, measured on thick yarn section. Pattern ideas for Catalina: The Atlantic City Shawl uses 4 balls of Catalina in two colors, the airy Cloud Cocoon Vest uses 4-7 balls. Both are $6 and available in-shop or on Ravelry. Many of us were taught to cast on over two needles for a looser cast-on. We find that really awkward! Instead, we just a drastically bigger needle. One size up is usually not enough to make any real difference, but 3 or 4 sizes up works great! In this class you will learn to increase and decrease, to knit in the round, to read a knitting pattern, and some fun new stitch patterns. FREE patterns are included for a hat, a baby blanket, felted coasters and more. By the end of class you will have a finished hat, knit seamlessly in the round! This adorable baby sweater is made in one piece and looks like a weird blob -until you do a quick origami-type fold and sew up the one seam over each shoulder. Before first class, please make a gauge swatch. 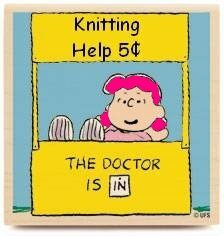 You need to get 20 stitches in 4″ using garter stitch.